These parts are frequently purchased together to make a repair. Dryer heating element assembly. 5400 watt 240 volt. Don't settle for lower quality aftermarket heating elements. This is a new GENUINE Whirlpool replacement part. 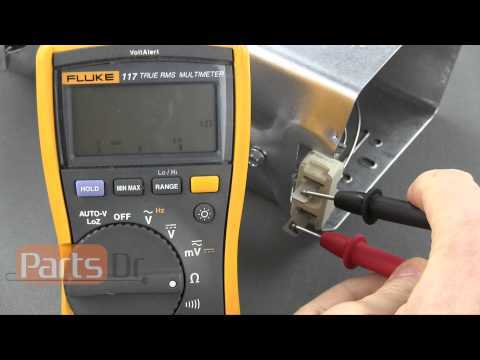 Learn how to test your heating element using a multimeter. Dryer was taking a long time to dry and then stopped heating all together. This was really easy to replace, we unplugged the dryer, removed the front bottom panel, removed the heat shield blocking the front of the element, unplugged the two wires going to the element (pliers helped to get these off), removed the one mounting screw on the left, and then the old element just pulled out of the canister firmly. Pushed the new element back in, and reinstalled in the reverse order. We also found that the blower housing that the lint filter slides into was FULL of lint. We cleaned this out at the same time. The dryer is now working much better and drying much faster! Nutdriver 1/4" for the bottom panel, 5/16" small wrench to remove the screw from the heating element support, nutdriver again for the the screw holding the element in the tube. Dryer not heating. Performed troubleshooting diagnostics and everything pointed to fuses or heating coil. Went to YouTube armed with my appliance name and model number and found a number of good instructional videos. Bought a multmeter to check for continuity. Appliance manual. Flashlight. Shopvac. Combo screwdriver/socket set. Camera to document color, placement and position of wires. Unplugged appliance as instructed before dismantling it. Vacuumed thoroughly but carefully to not disengage any connections. Documented what I was going to break down with photos, drawings and notes before taking it apart. Broke down suspected faulty part. Tested all three for continuity. Heating element was the bad part. I even found the break in the coil! Made notes of the part numbers on all three pieces. Secured panel back in place so pets could not crawl inside unit. Parts Dr. recommended by poster of video but compared prices on-line as well as local retailers. Ordered all three parts just for future back up. Parts arrived within time promised. Having watched the videos over and over while waiting for the parts to arrive, I knew I could do this successfully. I set a time goal and began the installation. Consulted my photos of wires and terminals and reconnected them. Secured housing with screws. Secured panel to front of dryer. Ta-da! Plugged appliance into socket. Advice from videos said to run on air only to make sure the dryer was not heating on that setting and as a way to check the mainboard for a bigger problem. Check. It also recommended that the the new coils could impart a smell. I ran it a few minutes on medium heat setting without a load. The dryer was tumbling and heating. I was back in business! Even if you don't feel adept at doing this repair, at least disassemble the machine and vacuum it. My estimates were $69.95 - $80.00 for a diagnostic that was non-refundable and would not be worked into the bill. $15 - $20 for every 15 minutes thereafter that the repairman was on the premises and cost of parts. I felt this basic repair was within my skill sets after watching the videos. I didn't have a multimeter but I had the other tools I needed. I spent approximately $78 and my time. I didn't have to wait for an opening for an appointment which at best was a week away. I didn't have to take time off or use a vacation day to wait for someone to arrive. I estimated I save $130. I gained a little knowledge, skills and confidence. I respect repairmen. But since I bought the washer and dryer for a total of $400 in great condition why spend $200+ for what could be a basic repair? I'm glad I took the time to do some research and a bit of work. I'm also going to vacuum the dryer duct and interior of the dryer on a quarterly basis to prevent a fire hazard and to maintain the appliance. This part PD00002365 (Mfg #WP3387747) works with all models listed.